The Puck can handle up to four 4K monitors, thanks in part to 4 gigabytes of GDDR5 VRAM along with three DisplayPort 1.4 ports and one HDMI 2.0 connection. 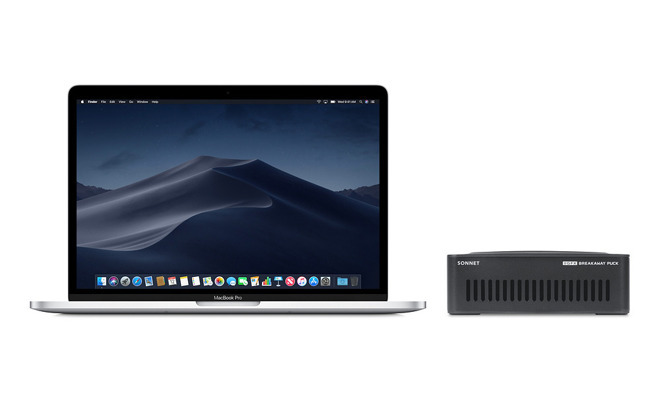 With this package, its bundled Thunderbolt 3 cable can supply up to 60 watts of power to an attached MacBook, versus the 45W that it supplied in the first version of the hardware. Another selling point may be size. The Puck is no more than 6 inches long, 2 inches high, and 5.12 inches wide, while weighing about 3.3 pounds. That makes it relatively easy to stash away on a desk, or even in some backpacks and messenger bags. There is also an optional VESA mount, to attach it to the back of some monitors. Apple is selling the hardware for $399.95. Some deliveries and pickups are expected to happen as soon as Monday, possibly a sign that outlets will have units on shelves the same day. Buyers must be running macOS 10.14.1 or later. macOS only recently gained support for the RX 560. Check out AppleInsider's roundup of some of the other Mac-ready eGPU enclosures on the market. In addition to buying from Apple directly, Sonnet's eGFX Breakaway Puck with the Radeon RX 560 can be ordered from Apple authorized resellers, such as B&H Photo. Those looking for a beefier GPU option can also pick up the Breakaway Puck with a Radeon RX 570 for $499 at B&H Photo and Amazon.